This recipe was posted the first time over at Yo Ho Yo Ho A Blogger’s Life for me when I guest blogged. But I just made it again the other day, so I thought I would repost it here because it really was delicious! If you like a little more spice in your popcorn, then the Three Caballeros Popcorn Seasoning might be something you want to try! How many of you remember the Three Caballeros? The cigar smoking parrot? Donald in a sombrero? I always enjoyed that movie, and when I came up with this recipe, with its spicy, peppery flavors, I thought it had some flavors they might have encountered in their adventures in South America. This one is pretty spicy, so if you’re a fan of a little tingle on your taste buds, then this would be a good seasoning to try. And in case you’re worried – it’s not too hot. I am not a big fan of things that make my mouth burn, and I thought this was pretty good. The recipe itself is really, really simple. Most of these ingredients you probably already have in your spice cabinet. The only one that might not already be there is chipotle chili powder – but it’s not expensive, and it’s pretty easy to locate. I’d suggest the international or Latin foods area of the grocery store. To be honest, I have made it without this and its much less spicy but still good. So if you really dislike spice, leave that one out. It will still be yummy! I prefer to stick mine in my spice grinder, mainly because I like the salt superfine. You can get the same effect (if it matters to you) with popcorn salt if you don’t have a spice grinder. But it isn’t necessary, because this will taste delicious either way! Measure everything into a small bowl or Tupperware. You aren’t going to use all the spice at one time, so its easier to make it in the container you’ll store it in. Then just combine chili powder, chipotle chili powder, smoked paprika, black pepper, cumin, coriander, salt, garlic powder, onion powder, and a really big pinch of oregano. If the oregano is dried and still in large pieces, just rub it between your fingers to get it a little finer. If you’re using the spice grinder, it won’t matter. Then pulse a few times in the grinder, or stir until everything is mixed. It makes quite a bit of seasoning. 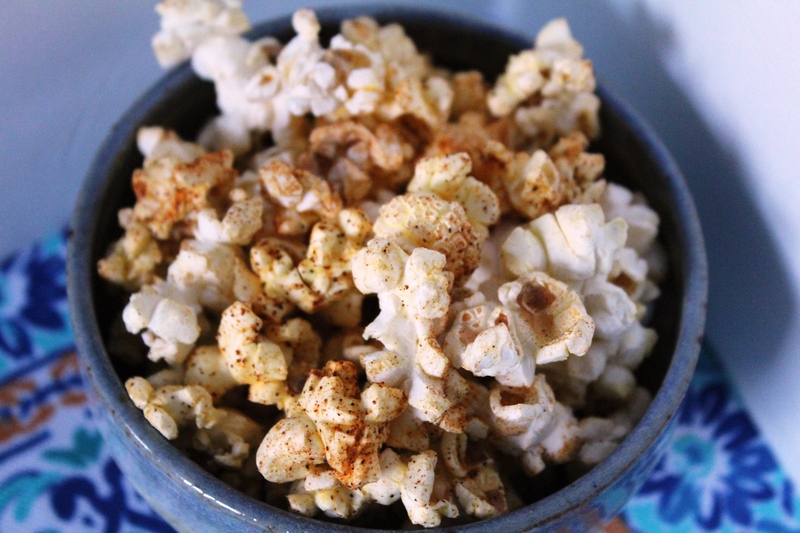 You can sprinkle it with a spoon, or put it in a shaker and shake it over your popcorn. Either way, only start with a couple teaspoons to a tablespoon and then taste. You can always add more if you want more, but I wouldn’t dump the whole lot on! I cheated and used a bag of microwave butter popcorn, but you can make air popped and just spray it with a little bit of cooking spray and then sprinkle on your seasoning. I’ve found that it has to have some sort of moisture added to get the seasoning to stick at all. Just toss it together, grab a couple handfuls and enjoy! Combine all ingredients in a small bowl or spice grinder. Pulse or mix until incorporated, then sprinkle over popcorn, either sprayed lightly with cooking spray, or add to a bag of microwave butter popcorn and shake!